To purchase A Jazz Life in paperback, please visit CreateSpace. To purchase for Kindle, please visit Amazon.com. 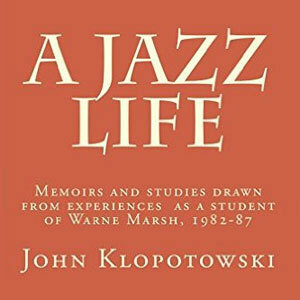 I had the good fortune to study jazz improvisation privately in New York with tenor saxophonist Warne Marsh during the years 1982-1984. These studies and period of time left a strong mark on me, and for many years I thought that both the story and information on the studies were worthy of publication in some type of book format. I eventually started writing what would become the book in 2005 and completed it in 2009. The book consists of two parts - the first is an account of the circumstances and events that led to studying with Warne, and the second is a description of the techniques and methods used. I wrote with a few people in mind, and the first were Warne’s two sons, K.C. and Jason. I have long wished that they could have known the Warne that I knew when I was a younger man, and I took Jason’s early advice to make my story personal. I also have always felt that I should share the material with any younger musicians who might benefit. To that end, please enjoy a free preview of the book along with purchase options for either the paperback or kindle copy.